In my post yesterday, I announced that Steve & I are currently going through the embryo adoption process with Nightlight Christian Adoptions. Unless you know someone who has gone through an embryo adoption, you probably don’t know much about it. You’re probably even thinking that it’s the same as IVF. As I explained yesterday, there are several reasons why Steve & I are not morally comfortable with IVF (in most cases). None of these reasons carry over to an embryo adoption. Since neither of us are using our own genetic material in the creation of an adopted embryo, there is no violation of the one flesh union of our marriage. We will also both have the same amount of genetic connection to the child: none. Just like any other adoption. Our adoption agency is a Christian organization, and they will not allow selective reduction in their embryo adoptions. A couple is only allowed to thaw and transfer as many embryos as they are comfortable carrying to full term and parenting, up to three embryos. They have helped us find a doctor that is comfortable working within these restrictions. Any embryos that we adopt but don’t thaw and transfer will be given back to the genetic family (the family that had them created) to adopt out to another family. We’ll be adopting all of the remaining embryos from the genetic family we’re matched with, probably 3 or 4 (but maybe as many as 10 or 15 depending on how many they had created in the first place) so it’s not unlikely that this will happen. Another important aspect of the program is that Nightlight doesn’t encourage the creation of embryos specifically for the purpose of adoption. 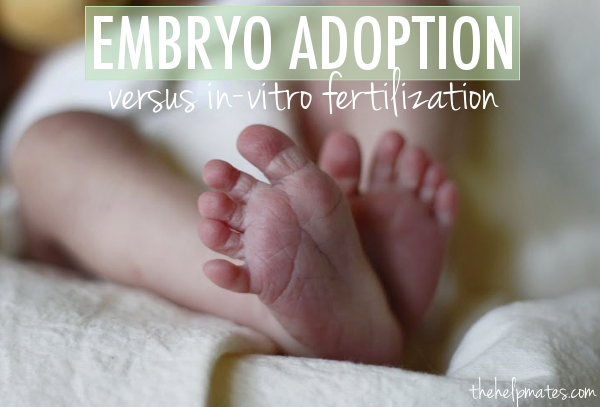 They only adopt out embryos that were created through IVF and are no longer wanted by the genetic family. At no point in the process are embryos intentionally created, destroyed or allowed to remain indefinitely stored. Clearly, there are a lot of safeguards in place in the embryo adoption process that aren’t usually present in IVF. Nightlight is very concerned about the sanctity of these little lives. Their safety and futures come first. You might also ask if we’re glad that there are couples who have created these ‘extra’ embryos so that we might have a chance at experiencing pregnancy. While I’m grateful to have this opportunity, I can’t bring myself to believe that I prefer the world this way. Could you ask the parents of a child they adopted through a domestic or international adoption if they’re glad that that child was abandoned by its parents, possibly abused, neglected, or forced to live off the streets so that they might open their arms to it? Not being such a parent, I can’t say for sure, but I would imagine that they love that child, and would prefer a world where it had only ever known love and safety. Similarly, I would prefer a world where there aren’t over 600,000 children frozen as embryos, waiting for reanimation that may never come, or worse, being discarded as if they didn’t matter. Explorer & adventurer - mostly through scratches of ink on a page - I enjoy my husband, our twin boys, our boisterous German shepherd, and strive to live for the glory of God. Hey! My husband and I will be pursuing adoption soon and hope to adopt internationally, domestically, AND through nightlight. We agree with this article and your views completely and I wondered if I could list this post as a resource for people to get to theough my blog once we announce or intentions? We have someone setting up an adoption fund for us so I wanted to make sure we were very clear about how we intend to use it. Let me know what you think! It’s so great to hear your heart for adoption! Of course you can link to my post. We’re about to launch a puzzle fundraiser, so I understand your concern for clarity. I’ll be posting soon about the expected cost breakdown of our adoption, so you might want to check back for that as well. Thanks for reading, and your blog is beautiful!